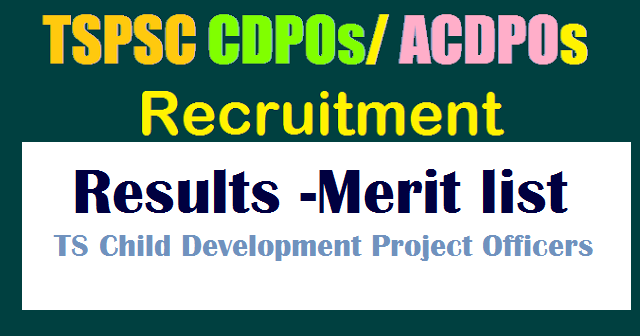 TSPSC CDPO Results, merit List, selection list, Cerificates verification dates 2018 TS CDPO Results 2018 TSPSC Child Development Project Officer merit List. The Telangana public Service Commission has released the TSPSC CDPO Results, merit List, selection list, Cerificates verification date 2018 at official site for the candidates who have done with the TSPSC Child Development project officer written test. the candidates who are eagerly waiting for the TSPSC CDPO Results, can check at official site or you can verify your TSPSC CDPO Results, merit List, selection list, Cerificates verification date 2018 here at bottom of the page a pdf has been updated for the guys who have wrote the TSPSC CDPO exam 2018. The TSPSC CDPO exam was conducted in paper 1 and Paper 2 the candidates can check their TSPSC CDPO paper 1 , paper2 Results 2018 and TSPSC CDPO merit List, selection list. Official TSPSC Child Development project officer Results, merit List, selection list 2018 updated by the Telangana public Service Commission candidates can get results from this page..
Aspirants can verify the TSPSC CDPO/ACDPO Results, merit List, selection list, Cerificates verification date 2018 . The job applicants who had done with the TSPSC CDPO exam are enthusiastically waiting for the TSPSC CDPO Results, merit List, selection list, Cerificates verification date 2018. The Telangana Public Service Commission has released the Child Development project officer notification and it has successfully conducted the exam and it has released the results official TSPSC CDPO Results, merit List, selection list, Cerificates verification date 2018 for the candidates who had done with the exam at official site www.tspsc.gov.in. TELANGANA STATE PUBLIC SERVICE COMMISSION: HYDERABAD CHILD DEVELOPMENT PROJECT OFFICER / ADDITIONAL CHILD DEVELOPMENT PROJECT OFFICER IN WOMEN DEVELOPMENT AND CHILD WELFARE DEPARTMENT (GENERAL RECRUITMENT) NOTIFICATION NO.50/2017) DATED: 13/09/2017. It is hereby informed that certificate of verification for Child Development Project Officer / Additional Child Development Project Officer in Women Development and Child welfare Department Notification No.50/2017 is scheduled on 09/05/2018 at Sankethika Vidya Bhavan, Beside Govt., Polytechnic College, Masab Tank, Hyderabad. It is further informed that, for further details visit Commission’s website (www.tspsc.gov.in). It is hereby notified that on the basis of Main Examination held on 04/01/2018 FN&AN to the Post of Child Development Project Officer / Additional Child Development Project Officer in Women Development and Child welfare Department, the candidates with the following Hall Ticket Numbers are provisionally picked up in the ratio of 1:2 to the total of 68 vacancies except 1:5 of ratio for Differently abled vacancies for Certificate Verification. The Certificate Verification is scheduled to be held on 09/05/2018 at Sankethika Vidya Bhavan, Masab Tank, Hyderabad beside Govt., Polytechnic College from 10:00 AM onwards. The candidates who are called for Verification of Certificates have to produce the following certificates in original along with a set of Photostat copies duly attested by Gazetted Officer at the time of Verification of Certificates, failing which, they will not be admitted in subsequent process of selection. No request will be entertained for subsequent submission of any of the required certificates. In terms of the Notification, the candidate should possess the requisite qualifications as on the date of the Notification. The Commission reserves right to disqualify any candidate, if she is not found eligible for any reason at any stage. Admission to Certificates Verification does not confer ipso facto any right for Final selection. candidates have to undergo a medical examination at respective Medical Board. 13. 2 sets of Attestation forms duly signed by Gazetted Officer.